Recently I was invited down to the St Nicholas Shopping Centre in Sutton which has recently welcomed new facilities, including a Sweat gym and the Games Garden. Never a stranger to a shopping centre, I was excited to try out the leisure facilities and have a little wander around their stores. First I headed to Debenhams for a masterclass with Urban Decay. Playing around with make-up is one of my favourite things to do with my spare time so I was in my element trying out the new Cherry Palette and adding a load of the old favourites to my Christmas list! The girls there taught us how to do a gorgeous halo eye using the palette which looked perfect for the party season. The boys headed downstairs to the new Games Garden - this is something we all loved as gaming is very much part of our lives at the moment with the launch of the PACVAN earlier in the year. Located on the ground floor it’s a great place for kids (and big kids!) to enjoy some games of pool, table tennis, air hockey and even some Mario Kart, Lego Avengers and Fifa. It meant I had a bit of time to pop into Next and New Look while they played. Mason can barely be torn away from his Nintendo Switch so he got settled right down on a bean bag for a game of Mario Kart. The place looks great, all brightly decorated in green astro turf and recycled wooden pallets and it’s free to use til 5pm. It’s perfect for anyone with kids who don’t like wandering around the shops for long. Also new to the centre is the Sweat! Gym. They use the latest technology to take their group classes to the next step. Their group exercises focus on working together and having fun while you get fit. They have spin theatres with great big screens to keep up the momentum and keep you on your toes (at times, literally!). Their BOX! 360 class sounds great fun and it’s exclusive to Sutton. It uses aqua bags, kettlebells, speed ropes and ab rollers for a 3-dimantional fun workout. Right now I have to roll sideways off the bed instead of using my abs to sit up so I’ll have to wait til the baby is here to give this a go! There’s a whopping 150 classes a week so you’re bound to find something to suit you. Whats more, members get 2 hours of free parking so there’s no excuse! There’s a selection of street food on the top floor. We all sampled some rather incredible desserts and milkshakes from Sugar and Spice. Now maybe I’m getting old, maybe it’s due to the baby on my bladder ensuring I make at least one visit but finding clean decent toilets always pleases me. The St Nicholas Centre has revamped not only their toilets but there’s a lovely family feeding room with nappies and wipes supplied for those little emergencies. It’s nice to see unisex baby changing so it’s not always left down to us ladies and perfect for days where Sam takes the kids out. The comfortable seating outside is a really nice touch too. We were given tickets to the Empire Cinema so Sam and I headed back a week later to see Bohemian Rhapsody. 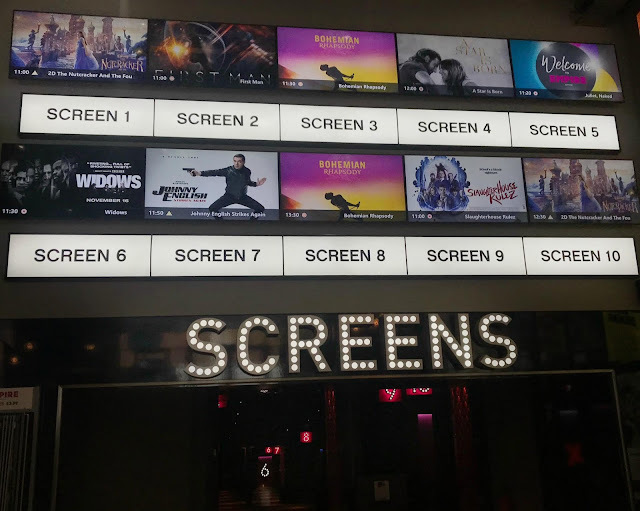 The cinema looks great, I haven’t actually visited since I saw Titanic here in '97 so needless to say it’s changed a fair bit! Walking in you can’t help but notice the revamp, it looks modern and fresh. 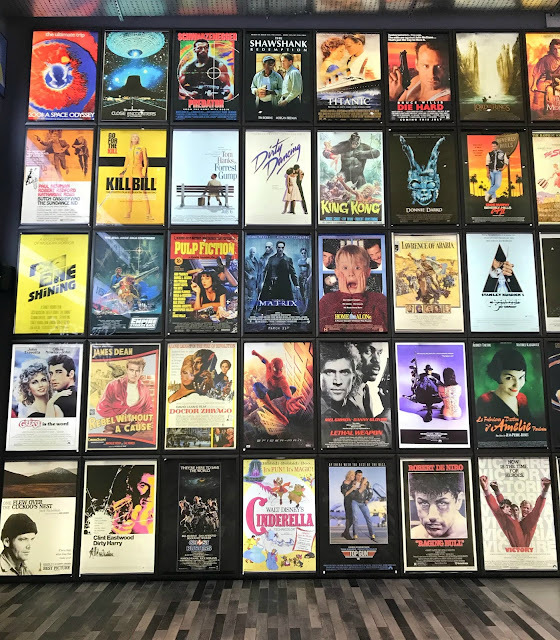 I really love the wall of old movie posters before you go to the screens. I've only seen 14 of the films you can see in this picture! The thing that really makes a trip to this cinema stand out is the choice of seating. From Monday to Thursday a standard seat is a really reasonable £7.45 and is a pound more over the busier weekend days. You can pay a couple of quid extra for a lovely soft sofa or even a recliner. Armed with a Cherry Tango Ice Blast to fuel my ice craving I headed to the screen to watch one of the best films of the year. 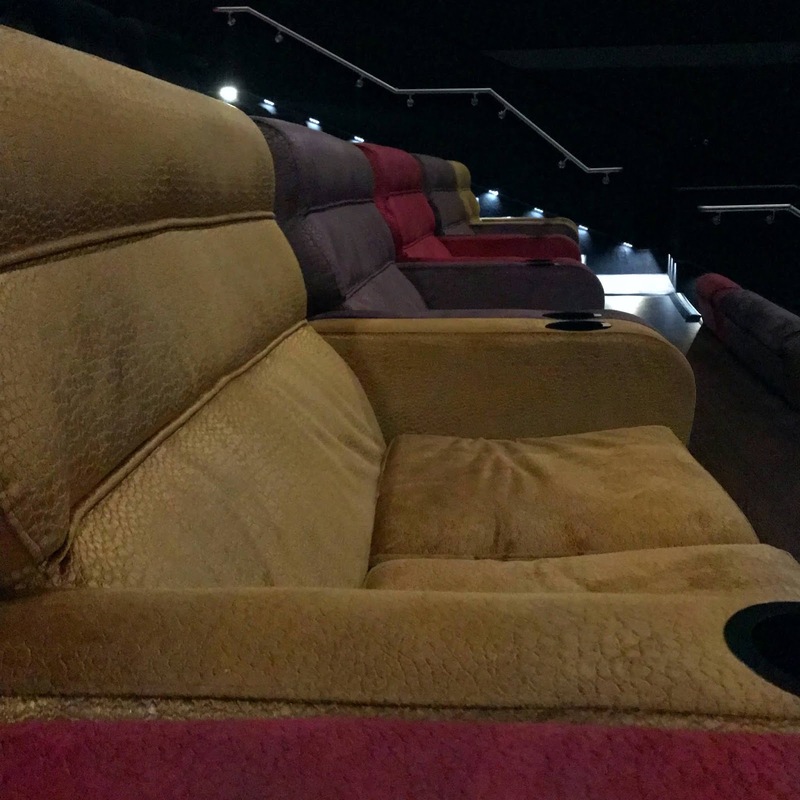 I loved every moment, I resisted singing along and it really was made all the more special sat in such a comfortable reclining chair which I could manoeuvre into the perfect position. I’ve recommended this place to everyone! If you really fancy a treat some showings have the option of D-Box seats which vibrate and move around for a real immersive experience! At only £10.50 per adult and £7.50 per child this definitely sounds like something I’ll be checking out! Top Tip- remember to validate your parking ticket and you get 3 hours free parking while you’re there! At the end of the year there’s a brand new soft play coming to level 3 which will provide hours of fun for children up to 7 years old. It seems like this centre is really catering for everyone and it’s great!